We are exposed to balance training very early in life. One of these early experiences is learning to ride a bicycle. Training wheels widens the base of support to help us practice how to remove them through narrowing and internalizing our base of support. Removing the training wheels is practicing retention of balance. 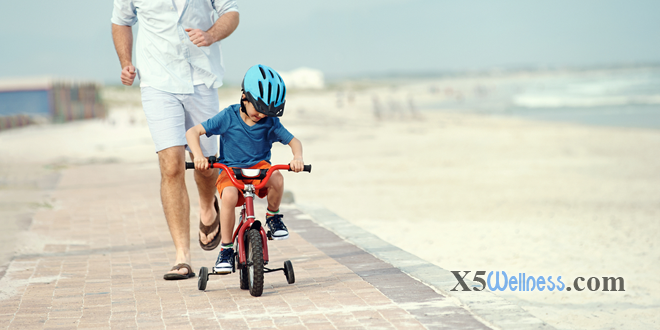 Placing training wheels and removing them are two parts of exercising a balance and retaining balance. Without training wheels, it is harder to reach balance and with training wheels it is harder to retain balance. You even need to balance when to use training wheels and when to take them off. Children do not need to know about the physics of center of mass to turn on their stomach in order to learn to walk. Those learning to ride a bicycle without training wheels do not need to know about proprioception, sensory input, equilibrium and spatial orientation connected to the vestibular apparatus to learn to ride a bike. A natural unconscious understanding of the process is built in all of us. Many work hard every day for a lifetime to forget the wisdom they were born with. Once the wisdom is forgotten, then they need to learn about the laws of nature and life through the conscious mind to find solutions. Effective solutions help us remember what we knew. They are not acquiring new knowledge, but the application of the old wisdom. The process of narrowing a base of support should not be limited to physical aspects of life. Imbalances that cause relationship tensions will show up in the ability to exercise and the mental focus within an exercise session. A balance disk is designed and limited to help correct a physical imbalance not a relationship tension. Your ability to retain an expanded view of the balance helps you seek and find expanded solutions that actually work. Limit your definition of balance to a spiritual concept, and you’ll end up spending time in meditation without any improvements to your lower back or injured knee. Limit how to regain balance to emotional realm, and you’ll likely end up in therapy with depression drugs. And you miss out on adjusting your diet that could help provide precursors of the neurotransmitters your brain needs to function right and feel good. Limit your definition of balance to a diet, and you’ll miss out on the satisfying relationships based on your communication skills that impact eating habits. Limit your definition of balance to exercise, and you’ll miss the general tensions that run through your body due to a mental image you are holding. The very act of trying to limit balance to one aspect of life is in itself and imbalance. This is one reason I work with balance indirectly by focusing on the process that increases self-awareness and self-reliance.